We go to cool places we have never been and having fun. What did you learn about racing last year that you are going to use this year? Why do you like Muddy Creek the best? Its long & has lots of big jumps. I know the track because I have raced it many tines. What’s the scariest part about racing? Hmmm…I really don’t know. I’m not scared when I’m on my quad. What is your favorite non-racing activity? Build MX dirt tracks for my toy ATV’s & dirt bikes. Chris practicing shifting on a friend’s dirt bike. Autism is an interesting affliction. It is estimated it affects about 1 in 68 people, however that’s unclear if it’s because Autism is a spectrum disorder – meaning there’s a wide variety of symptoms from mild to severe that fit the definition – or if it’s because Autism has seen a lot more recent study and we know much more about it now (CDC website). Scientists recently discovered Autism develops in utero, where the brain doesn’t form correctly and instead is missing “patches.” This is believed to be why there are so many variations of Autism (Medical News Today website). The only thing certain of kids with Autism, is that every day is a challenge. For themselves, for their parents, and for those that love or teach the Autistic. Chris Furches is no exception to this, even though he is considered “high functioning.” At 15, he is emotionally, academically, and intellectually much younger. This sometimes manifests itself in what some parents might call a tantrum, but to Chris’ parents, they recognize it as a meltdown. Chris can have a meltdown when things get out of routine. For example, if he has a problem at the gate and doesn’t start the race with the rest of the racers. That’s out of the ordinary, and it is hard to process for him, and he becomes overwhelmed. We asked Tim and Stehanie Furches some questions about Chris, and their experiences as well. When did you first get the diagnosis for Chris, and how did you react? Chris was diagnosed at age 9. We will never forget the meeting with the doctor. We had family from both sides there. Believe it or not we were somewhat relieved to have an answer. After years of doctor visits, therapy, tests, evaluations, and more we had an answer. We didn’t know what autism was but we knew we could handle it because of our love for Chris and we knew we had a great support system (our family). What were the next steps for you, after learning of his diagnosis? Immediately we went on a mission to research autism. We wanted to learn about why he was the way he was. The next step was to try to follow a plan provided by the doctor who diagnosed him but we found within a month or so that wasn’t the best direction for Chris so we stepped out of the box so to speak. We immediately took the diagnosis to the school system to get a new IEP drawn up for Chris so that we could get him the best education possible. We coordinated with his doctors for speech therapy and occupational therapy. We moved more from frustration and helplessness with Chris to more supportive and understanding. We worked hard as a family in whole to support and assist Chris with his autistic traits. You obviously had to work with Chris a long time before he got into racing. What did life look like before racing began to help him? Chris has always been very active and energetic. He has strong gross motor skills. Going to the park to play wouldn’t cut it and usually he ended up being picked on. Chris would play by himself for hours and most of the time he ended up getting in some kind of trouble or taking risks that could seriously injure him. He was very solitary. As parents it troubled us that Chris was trapped in a shell. We knew he had potential but we didn’t know how to get him to open up and shine. We were sad to see Chris like he was. He had no friends, communication at different levels was a problem, he had meltdowns over the simplest things and people that would see this would judge and give us terrible looks, his eating habits were so limited, he was easily bullied, he didn’t want to be touched or really hugged, he had so much difficulty understanding the world around him, and if he got stressed he would do something dangerous even run out in front of cars. We tried all types of sports looking for an outlet for Chris and we were seeking some “normalcy”. We thought putting him in a sport he would blend and feel good but none worked out due to trouble with his social skills and his inability to understand plays and rules. Honestly the more we tried to put him in team sports the worse we felt and we believe now looking back it wasn’t healthy for Chris. Every parent has fears when their child is racing. Do you feel like you have additional fears for Chris? No. We honestly have fewer fears for Chris when he is on the track than when he is not at the track. We worry more about him when he is at school or the very few times he is with someone else. When did you first start noticing racing having an effect on Chris? We started to see a change in Chris within a couple of races. The first changes were he slept better. What do you think has been the biggest leap for him, thanks to racing? His social skills without a doubt! Some days have to be more difficult than others. What do you do to keep your sanity? It really depends on the issues but Tim escapes to the garage to work on the quads. Because I spend so much more time with Chris it’s a bit more difficult for me. I do a few things. I go get on the computer, I send Chris outside to play, I go work on the quads, and /or there are some times I emotionally breakdown by either crying privately or I find myself yelling. I pray a lot, too. Racing though is our true outlet! It’s just as important to us as it is to Chris. Did you “mourn” the loss of having a “normal” child? No not at all. We never have felt that way. Chris is Chris. We wouldn’t change him even if we could. If you had one wish for his future, what would that be? Happiness! No matter where he goes and what he chooses to do we want him to be happy and content. As far as being a typical race family – dad’s the mechanic, mom’s the race support – do you think Chris will take on more responsibilities later? Perhaps working with dad on his bikes? We are trying to do that now. We feel he should be helping with simple maintenance like lubing the chains, cleaning air filters, and help with detailing. We also expect him to help with getting our pits set up and packing up when at the races. He has trouble with knowing what the specific tools are so we have not gotten into teaching him any mechanics yet. Maybe as he matures more mentally he will take more of an interest in the mechanic side of racing. Where do you feel that Chris shines on the track? 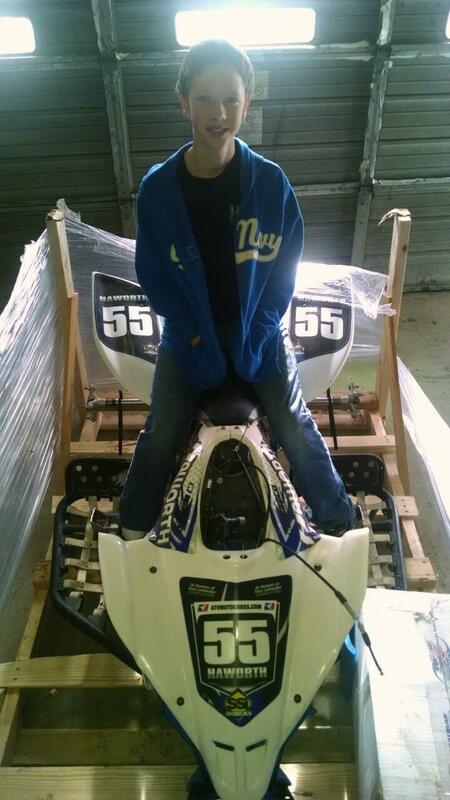 He has great rhythm through the whoops, he’s fast off the gate, but his greatest strength is he is a smart racer. At the local and regional races he will only push himself enough to keep himself out front if he is leading. He doesn’t take unnecessary chances when there is no need for it. He will tell you this. Of course he would like to get huge air and hit those big jumps but he won’t try it if he doesn’t feel he can truly commit or he knows he doesn’t have the power to clear it. We hope this skill can be put to use in his everyday life. 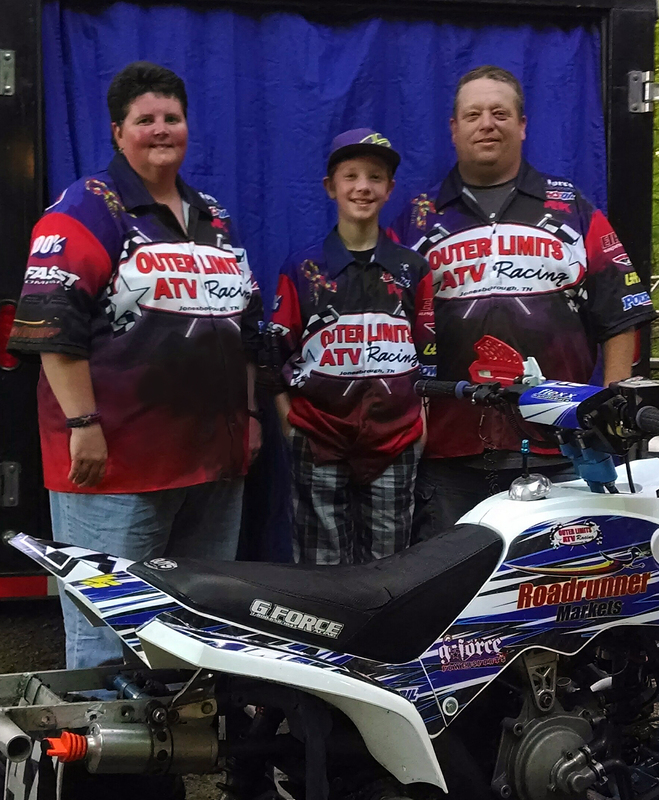 How would you recommend other families with Autistic kids get into racing? It’s daunting enough as a newbie to get into the sport! If their child is comfortable on a quad we first recommend making sure they have enough protective gear. Some kids can only handle a helmet and boots while others can handle wearing all the protective gear you can put on them. Next step is finding a local MX practice track. A motocross track can be a very loud place so bring ear plugs or some sort of ear protection to muffle the sound. This will help reduce their stress as well. 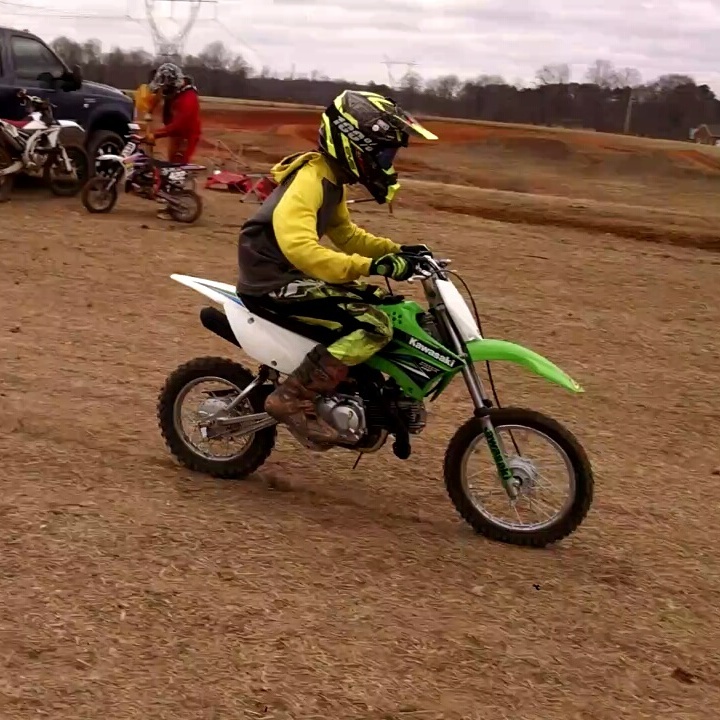 Let your child get use to the track, how the machine feels, see how they do and react on the track. You will find out how your child feels about the sport pretty quickly especially when they are grinning from ear to ear! We didn’t do this but another option is if the parent has a quad to ride with their child. Support and encourage them. While at the track you can talk with other families or the track staff about racing. They usually can direct you to a local MX promoter, promoter’s website, or a motorcycle shop that can guide them. Of course anyone can contact us about interest in getting into racing whether they have an autistic/special needs child or not. We recently have had 2 families with autistic kids wanting to get started into racing. We are always here to help. We want families with special needs/autistic kids to understand that pushing them will not help them. You are likely to have them turn off, push the sport away, or have a meltdown if you do. Let their child learn, absorb, and embrace the sport at the speed they feel comfortable. It’s all about their child’s comfort level. Make it a fun and positive experience for them and try not to overload them. Take it one step at a time. You may find out they love the sport and can’t get enough of it. What has Chris taught each of you, as a person and as a parent? As a person, he has shown us a new way to look at the world around us. He notices things we never would have seen and teaches us to look at things differently. He has taught us a love that is deeper, purer, and truer than we could have ever imagined. He has taught us not to give up and to keep persevering no matter what. As a parent he has taught us patience. We were not very patient in the beginning but have quite a bit now days. He has taught us there is no standard/typical family. We use to want to be the family like everyone else. Not anymore. We are the Furches family. We are who we are. There is no standard or set way to be a family. We follow a beat to a different drum and that is ok with us.